Third 1–Week Melt in the Arctic: 3rd Time’s the Charm? March 9th to 16th saw the third 1–week melt or compaction of sea ice in the 2019 Arctic. That is, the sea ice extent reported by JAXA was lower than 7 days before for the third time this year, be it primarily due to wind or actual melting of ice. Arguably, every single day of the year contains a combination of melt and freeze, or compaction and expansion, so clearly, we’re talking about a net melt. Possible annual sea ice maximum: March 9–16 saw weekly extent decline for the third time, and the 57,000 km² decrease was enough to take 2019 from 9th to 7th lowest. 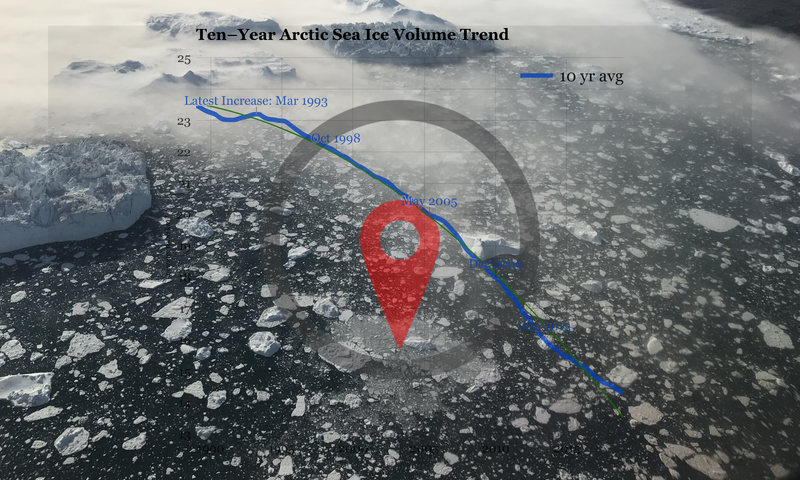 Sea ice volume showing an irreversible, post–Tipping Point collapse towards zero Arctic sea ice. Arguably, this is the most significant graph in all of human history, revealing both the lies of the UN and the larger Climate Change Community and the now inevitable fate of Global Industrial Civilisation. Please help share this most important graph revealing persistent decline and a climate Tipping Point several decades back in our past: The true Tipping Point for ice is not at a future date or a yet to materialise future temperature threshold, it already happened. Q: How can anyone make a decadal average graph? A: Easy. Use a computer. Add all the ice for the latest 3650 days, divide by that number of days. A: Let’s say you want to know how much ice we have in the latest decade compared to the decades before that.